Mogren’s transformation began, in part, when he met the Sisters. Since 2008, the Sisters have leased his home (The St. Jane House) for retreats to women seeking empowerment, students wanting enlightenment and mothers shedding resentment. 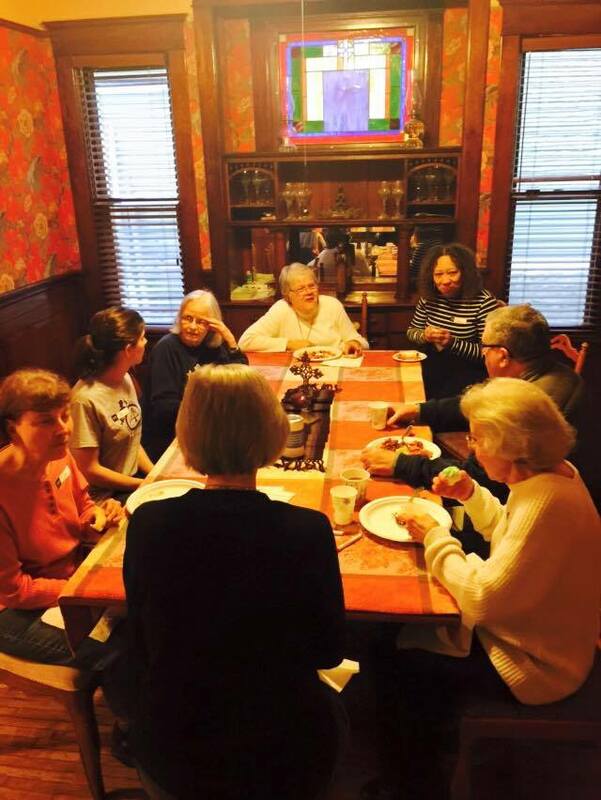 A grass-roots group, From Death to Life, counts the St. Jane House as its home. 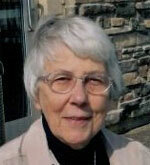 Its founder is Mary Johnson, a mother who sought out, and forgave, the man who killed her only son. Mogren serves on the board. His journey owes something to an epiphany moment years ago when he was leaving a parish council meeting at St. Philips Catholic Church on 26th and Bryant Ave. N. He noticed a woman frantically trying to pick up papers strewn about the street; she’d left them on top of her car as she pulled away. Now she was scurrying to pick up the papers and sheet music and Mogren gave her a hand. They walked back to the church arm in arm. The moon was out. The evening was quiet. And Mogren felt at peace. Suddenly a car with dark-tinted windows pulled alongside, rap music pounding as the back window began to roll down. Mogren’s moment of bliss turned to terror, fearing they could get hustled, hassled or hurt. Just then, a teenage boy stuck his head out the window, smiled and said, “Hi, Miss Muggs.” This was a teenager talking to a 70-year-old Irish Catholic. “They had love and affinity for one another,” Mogren recalls. “Later I wept. 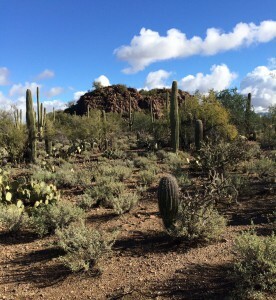 I thought, ‘Oh, my Gosh.’ This is what it’s all about – connecting across difference and discovering our common humanity. I felt called to move to the Northside.” He did, building what would become the St. Jane House in 2003. .He moved in and became an official North Minneapolis resident, still holding on to his creative job at Target. 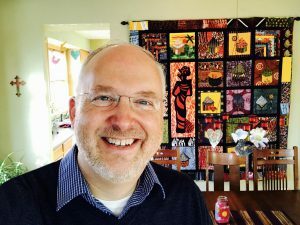 He decided to quit, after 24 1/2 years, following another epiphany experience – this time while listening to a tape of students’ spoken-word poetry. “I remember hearing the urgency in their voices,” he says, “and in that moment my heart was burning. I needed to do what I could to ease the pain and provide a path for those who needed it. I wanted to make a difference.” A big part of the difference began when the Sisters and Mogren got together with the St. Jane House. He had the space. They had the plans. They’d bring the people. He’d be the director. 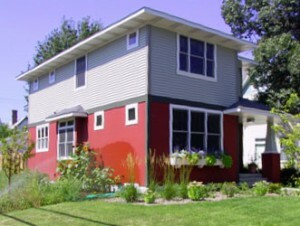 In the years that followed, the St. Jane house has provided guest rooms for overnight visitors, hosted a weekly centering prayer group, offered retreats for healing and support groups and served as home base for students – high school and college – seeking an “immersion experience” in the flow of neighborhood life. Mogren remembers first meeting the Sisters at St. Philips where he started attending mass because of his respect for Father Greg Tolaas. 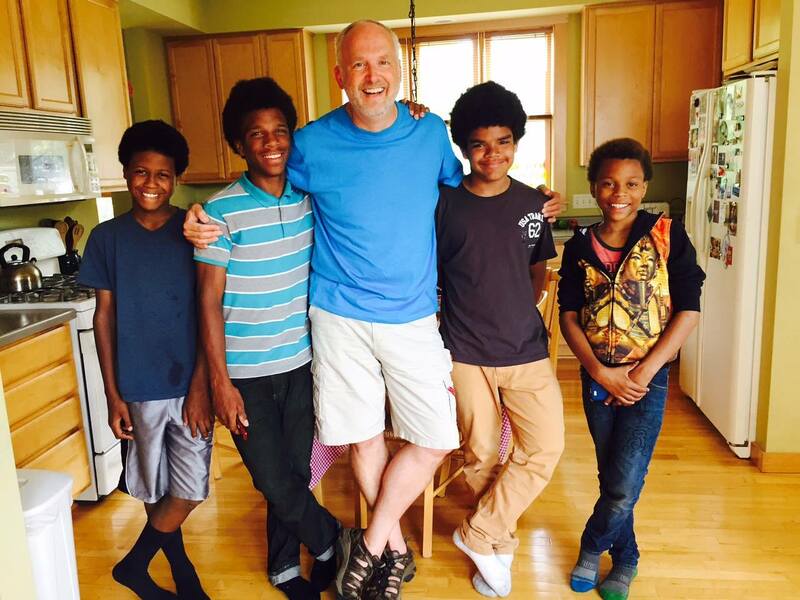 He met them there, but he really got to know them after he moved to North Minneapolis. 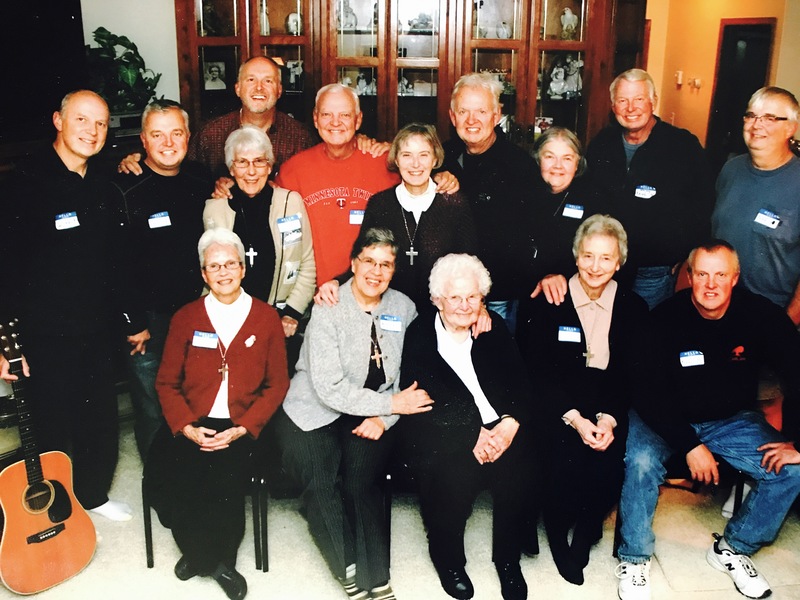 “I feel loved and celebrated by the Sisters,” Mogren says, “ever since I met them. It’s wonderful to be in the presence of their non-judgmental, joyful spirit. They have helped me to be gentle with myself and that helps me to be gentle with others. They embody the God of my understanding, and they define the notion of inclusion. Sister Karen notes that Mogren, now 51 years old, is something of a Renaissance man, who’s an artist, a graphic designer, a photographer and a fun-loving guy with a sense of humor. 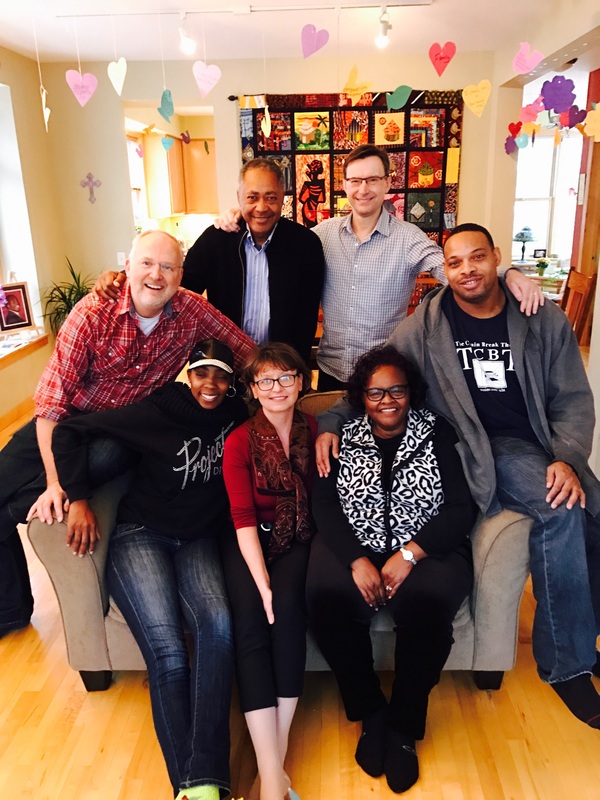 Mogren, who lives in the basement of the St, Jane House, prefers to think of it as “the garden level.” “Brian was inspired to begin the Alafia Foundation to encourage leaders from the neighborhood,” Mohan says. “He has mentored a few young people who look on him as a role model and friend. He loves North Minneapolis and it shows.” Mogren would smile at that description. He’s a man who loves where he is: in his city, in his heart, in his life. “I don’t see any other than the life I’m living,” he says. 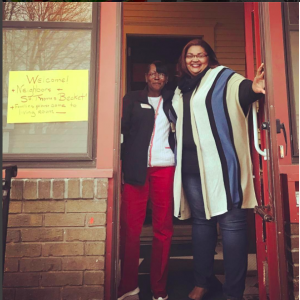 “I get to be who I am and to be that well.” That’s why the welcome mat is out at the St. Jane House. Please join us for 2nd Salesian Monday night on May 8th. 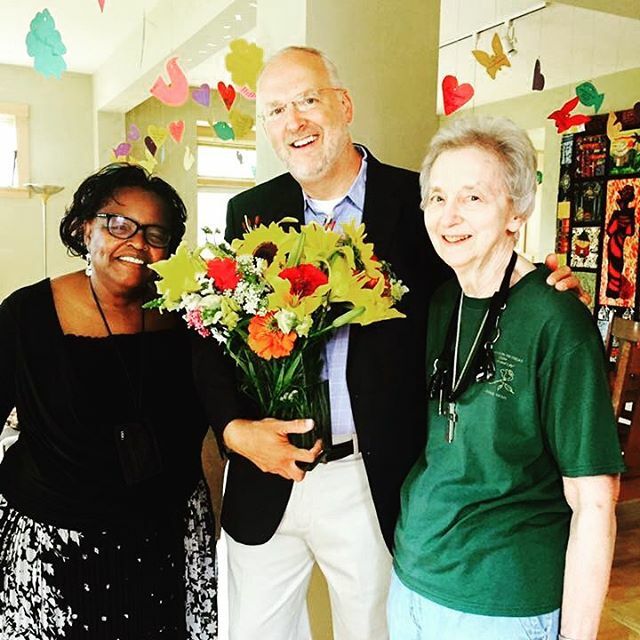 Our topic is Divine Hospitality, featuring Dave Nimmer and Sr. Mary Frances. This year’s Salesian Spirituality series is entitled, “LIVING JESUS AS WE MOVE THROUGH OUR DAILY LIFE.” We invite you to join us for food and fellowship, input and reflection, before closing our evening with prayer. 6:45pm-8pm: Presentation and PrayerCome for either part, as you are able! Questions? 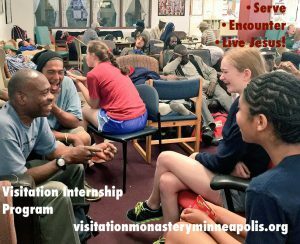 or to RSVP: Call Sr. Suzanne at 612-501-5096. Trips to special places are not complete until a photo is taken at a memorable location. 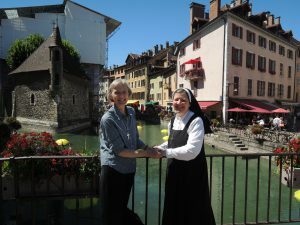 Two of the photos shown here are from a favorite “photo op” site in Annecy, France, birthplace of the Visitation Order. 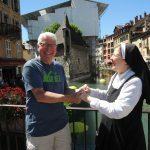 Sr. Susan Marie from our Visitation Monastery in Brooklyn, my brother Michael, a faculty member at the St. Louis Visitation, and I are standing on the bridge in front of the once -used prison built in the canal in old town Annecy. 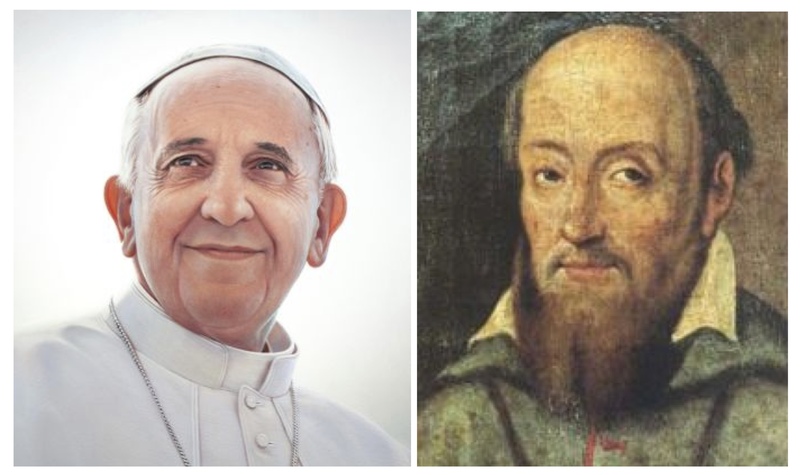 St. Francis de Sales visited prisoners there, we are told. The three of us had spent this hot summer afternoon “in the footsteps of St. Francis de Sales”, and we even took a cruise on Lake Annecy. My joy expanded as we explored our Salesian family roots together before beginning a workshop on the Treatise on the Love of God. 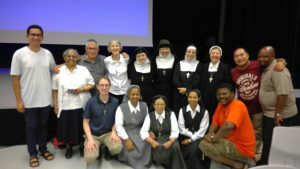 Being there with Michael, Sr. Susan Marie, three other Visitation Sisters and other “Salesians” made it feel like my own version of “All in the Family”! “All in the family:” our global Visitation “household”! Oblate of St. Francis de Sales scholars and the generosity of their superior general, Fr. Aldino, this hope was realized. The week included prayer, input and small discussion groups, and opportunities to explore the town. This “All in the Family” study week offered me a unique way of appreciating the Spirit alive and active through my broader Salesian family….and that was a blessing. 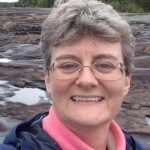 To read other blogs by Sr. Karen Mohan, and other community members on their pilgrimage experiences, click here. The Visitation Sisters are happy to announce that we will once again host the Second Monday of the Month Salesian Evenings. 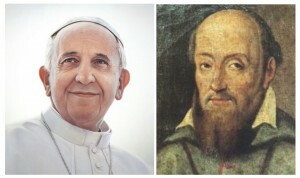 Catholic Social Teaching and the Two Francises: Pope Francis and Francis DeSales. 6pm – Dinner; 7pm – Presentation; 8pm – Night Prayer. 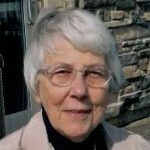 The speakers for this first week are Sr. Mary Virginia Schmidt, who was the chairperson for the committee responsible for the booklet, Justice Shall Flourish, which will be used as a resource for the Monday night presentations. 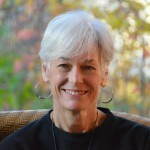 Brenda Lisenby, who is finishing her year-long Monastic Immersion Experience with us, will be co-presenter for the evening. 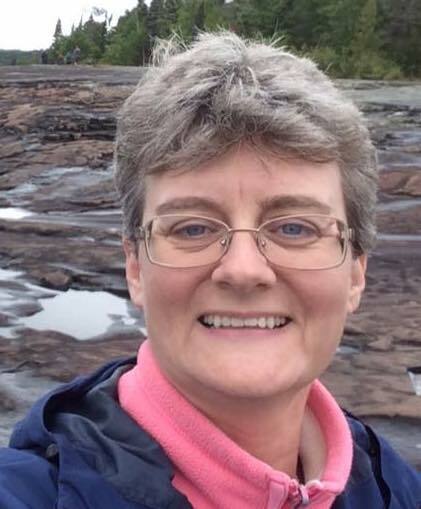 Brenda will be bringing Pope Francis’s encyclical Laudato Si into the discussion, particularly some views on caring for our planet. This first session of the Series will also include meeting new friends, touching base with people we haven’t seen for the summer and planning our participation for the coming months. The sisters will provide the entire meal for our first meeting and we will sign up to bring items for the next months. Supper will be at 6pm and our ending time will be 8:30 pm. This includes Night Prayer after the Presentations. Plan to attend whatever parts of the evenings you can. We look forward to welcoming you to this time of Salesian study and community fellowship. Take Me Out to the Ball Game: The Power of Story! On Friday, August 7, 2015 I threw the first pitch at the St. Paul Saints’ game. On that gloriously clear and sunny ‘Minnesota-at-its-best’ evening at the ball park, little did I realize God would re-visit me with my own very personal Sacred Story. The Cookie Cart folks had asked me to represent them, as they were being recognized that evening as a nonprofit doing significant work with the youth of North Minneapolis, with plans to expand to St. Paul’s East side. 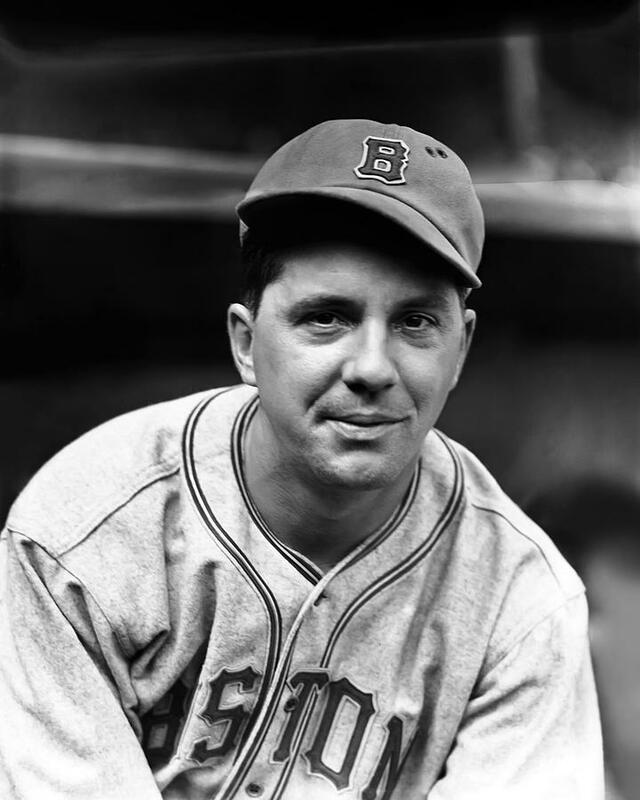 The day I was born in St. Paul, my dad was playing a double header with the Boston Braves in Pittsburgh. At the 7th inning stretch the announcement came over the loud speaker: “Bobby Reis has a baby girl!” It was Father’s Day so it was an even bigger deal! I always like to remind folks that I got a standing ovation at my birth!!! Eventually, ‘Daddy’ left the “Big Leagues” to play with the St. Paul Saints. Back in those days, baseball was more about the sport than the money. (My dad sold Hoover vacuum cleaners on the off season.) I remember going to the games and being so proud of him and enjoying the fun atmosphere with the sport and the crowd. 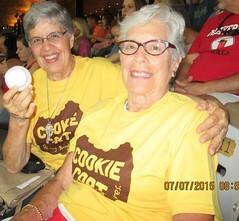 Memories of my dad’s career* rushed in on me as I sat in the stands behind home plate with my sister, Susan. 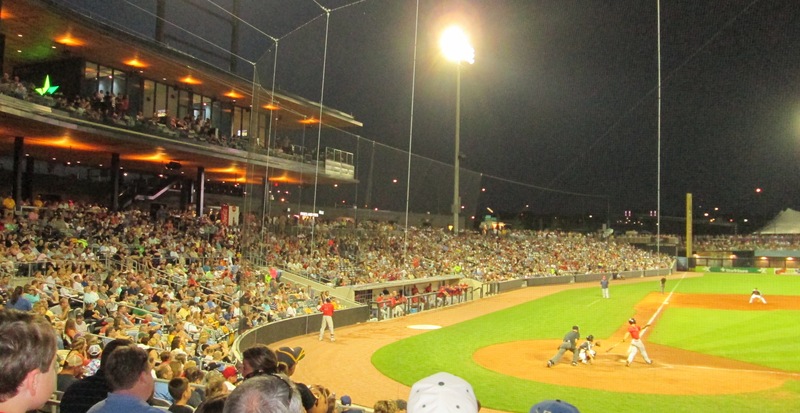 If you’ve been to a Saints’ game in recent years, there’s lots of entertainment, from the pig bringing the baseballs out to the pitcher and a lady dancing on top of the dugout, to the fireworks display at the end. In spite of, or shall I say — in the midst of all of it, I had a sacred, precious moment on the Sacred Ground of the St. Paul Saints new stadium. Give yourselves a gift, Everyone: Touch into your own Story and that of others. We are on the planet together for a Sacred Reason, helping one another keep a light heart in the midst of life’s challenges and gifts. Take me out to the Ball Game! May Jesus Live in all the Sacred Stories of our lives!